Almost since the beginning of the Ronin Institute we had – what used to be called back in the aughts – a “blogroll” – of all Research Scholar blogs. As part of last year’s site refresh – the “Blogs of the Ronin” are now properly displayed sidebars. We also have a new dedicated page – Scholar Blogs – displaying the most recent post from each blog (those that have an RSS feed). Go and check them out! If you’re a Ronin Scholar and have a blog that you would like to have listed, please contact us with the link to the blog, and RSS feed, so we can add you to the aggregation. (Conversely, if you are currently listed and would like to be removed, also let us know). Ideally the blog would contain a good number of posts related to your scholarly interests, but this is by no means a requirement: a blog that mixes personal and research interests is also fine. If you have several blogs, probably choose the one with the most scholarly-related content. It’s may also be possible to filter and only aggregate posts within a certain category, let us know if you would like to do that. Since the first PTW in 2001, the conference has been a gathering place to explore and celebrate performance as a catalyst for human and community development and culture change. PTW is now a global community of hundreds who creatively engage social problems, educate, heal, organize and activate individuals, organizations and communities, and bring new social-cultural-psychological and political possibilities into existence. Building on the conversations started in the related CESTEMER meeting last year, several Ronin Institute Research Scholars will be holding a session “Performing New Models of Scholarship at the Ronin Institute” at 5:15pm on Saturday afternoon. I’ll be joining Research Scholars Kristina Baines, Victoria Costa, (Kristina and Victoria are also co-founders of the Cool Anthropology collective), Jocelyn Scheirer, and Jon Wilkins. They will be giving short presentations on their different projects and how they feed into new models of doing research in their fields and beyond. The panel after will invite the wider PTW community to collectively explore a better future for scholarship. If you’re in the NYC area and interested in attending, come join us! I believe it’s not too late to register. Let us know if you do! You can also find more on our Mission and Why Ronin? pages. The Ronin Institute has launched its own YouTube channel! We’re posting our videos from the Ronin Institute seminar series there. 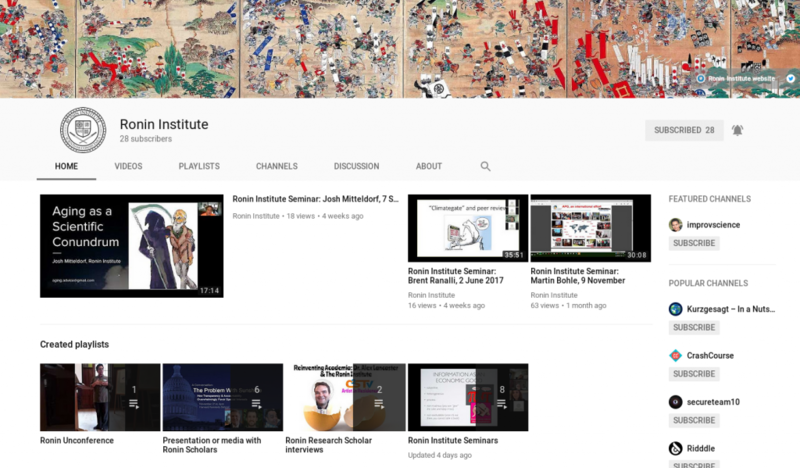 It also includes playlists of videos that feature Ronin Institute Research Scholars and their work, such as symposium panels, performances, TV or web interviews, as well as presentations at Ronin events such as Unconferences. (If you’re a Ronin Research Scholar yourself, please send us links to existing YouTube videos that feature your work, or feel free to upload them and point us to the video). The Cultivating Ensembles in STEM Education and Research (CESTEMER) was held at the Goodman Theater in downtown Chicago on September 15-17, 2017. Initiated by Raquell Holmes and improvscience in 2012, it brings together a diverse mixture of scientists, artists, humanists and performers to discuss and discover new ways of doing science in groups. I attended to share what we’ve been working on at the Ronin Institute, as well as gathering new ideas and strategies for the way forward. There are now many great venues and conferences for discussions on improving science communication, the value of creativity in our workplaces, or integrating the arts and humanities into STEM and education – CESTEMER was about all of those things, but with an added unique emphasis on group performance and play. In addition to the regular talks, poster sessions, and keynotes, all conference attendees had opportunities to participate as performers through games and techniques drawn from theater and improv. This meant the conference was not the usual armchair experience – all conference attendees were co-creators of the performance that was the conference itself. Why is this important? Performance is critical to group learning because of it’s “show, not tell” and experiential nature. To take just one example, the workshop run by Nancy Watt and Carolyn Sealfon “Whose Idea Is It Anyway?” tackled the ownership of ideas in science. Workshop participants grouped together to solve a physics problem and were asked to “play” different characters drawn from several personality types. By experimenting with different characters, we were able to experience how each group solved problems based upon their willingness to build on other’s ideas, embrace mistakes as learning opportunities, share credit and move the collaboration forward. The intense competition to demonstrate individual “ownership” of an idea often prevails in the academic world (coupled with an artificial scarcity that is perpetuated by the journal prestige system amongst other things) can sometimes lead to an atmosphere of distrust. Therefore the direct experience of the value of empathetic collaboration to produce both better results, as well as unexpected and serendipitous discoveries, through such workshops, will become increasingly invaluable as a means for cultural change in our institutions. This bottom-up approach, coupled with more top-down changes in publications and funding incentives, will, I believe, lead to more durable cultural change than either alone. Plus it’s also a much more fun way of doing science! In summary, CESTEMER was a really fantastic opportunity to generate new “spores” in our evolving ecosystem of science and scholarship. I thank CESTEMER for inviting us, and I’m excited for the Ronin Institute to become part of this conversation. I look forward to all these spores travelling back to each of the participants’ everyday workplaces and spreading the message that we all do our best work when we listen and play together. I plan to attend the next CESTEMER conference in 2019 and I invite anyone interested to join me!